Medallions usually weigh less than 2 ounces. In beef-speak -- or the language of steak -- you often find numerous names for the same cut of meat. 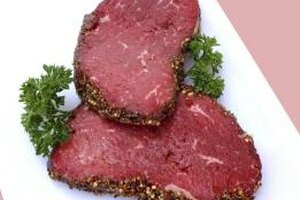 For example, steaks cut from the tenderloin go by chateaubriand, filet de boeuf, tenderloin steak, fillet steak, filet mignon and filet medallions, depending on the butcher, the market, the restaurant, the region and, sometimes, the chef. 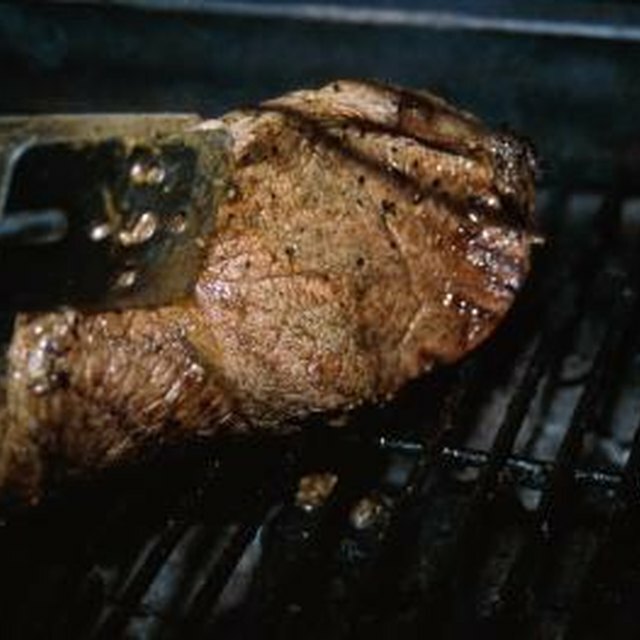 "Medallions" refer to thinly sliced steaks from the mignon, or small, tapered end of the tenderloin. Medallions are usually about 1 or 2 inches wide, and 1/2 to 1 inch thick -- almost too small to grill -- unless you modify your grilling method. Soak wood skewers in water for one hour. Plan to fit two or three medallions on each skewer, depending on their diameter. Set up your grill for indirect cooking. If you have a gas grill, light the two outside burners and leave the center burner off. On a two-burner gas grill, light only the left or right burner. Close the cover while the grill heats. If you cook with charcoal, light a chimney starter full of lump charcoal and let it ash over. Empty half the charcoal in the chimney on the far-left side of the charcoal tray and the other half on the far-right side of the charcoal tray. Leave the center of the tray free of charcoal. Close the grill cover. Coat the medallions with oil to prevent sticking. Season the medallions on both sides to taste, as you would full-size fillets. Lay the medallions flat on a cutting board. Insert a wood skewer into the side of a medallion until it comes out the other side, so that it resembles a lollipop. Slide the medallion down the skewer until it reaches about 1 inch from the bottom. Slide a second medallion onto the skewer until it's about 1/4 to 1/2 inch from the first medallion. Slide a third medallion on the skewer if it fits. The medallions need 1/4- to 1/2-inch of space between each other on the skewer. Continue threading the medallions on the skewers. Lay the medallion skewers in the middle of the grill, over the portion without charcoal or direct heat. Space the skewers so the medallions don't touch each other. Grill the medallions for about five minutes for medium-rare, about seven minutes for medium, and 10 minutes or more for well-done. You don't have to turn the medallions when cooking them with indirect heat. Move the medallions over the coals or lit burners to cook for about one minute after you cook them in the center of the grill. Cooking briefly over the coals gives the medallions a finishing sear. Skewer quick-cooking vegetables, such as halved button mushrooms, tomatoes or onion slices, between the medallions on the skewers and serve them on a bed of rice for a classic kebab meal. Grill dense veggies, such as peppers and eggplant, on separate skewers over indirect heat while the medallions cook. O Chef: How Do You Say "Skirt Steak" in English?